Kimberly Boulon Fine Art Gallery also features signature artworks by a number of local artists. Their pieces reflect the themes presented by the annual shows. See Events page for more information. St. John is a tropical paradise. It's a tranquil, largely unspoiled and serene little island floating out in the middle of a sea. Deep within the island's energy run powerful currents of a complex history. They are present in the landscape, unmistakably tangible when running trails, seen while visiting timeworn sugar mill ruins and felt on its tranquil beaches. 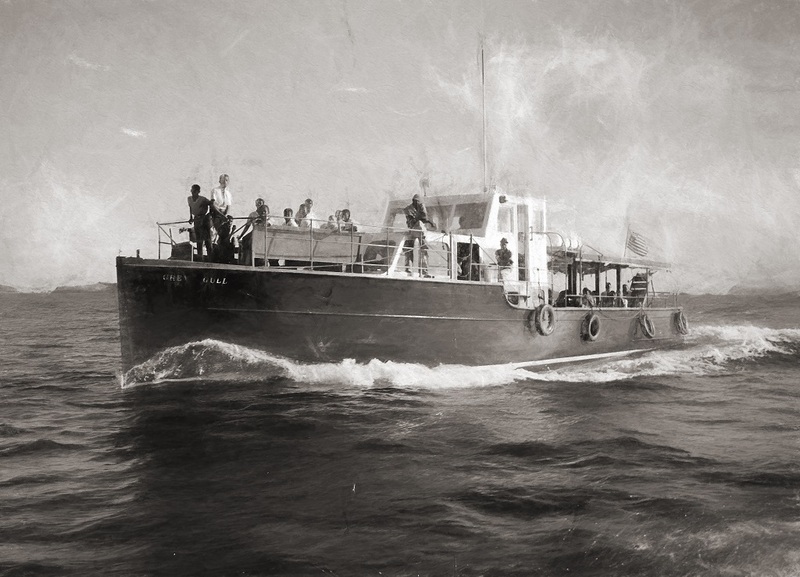 Thankfully because of the St. John Historical Society's education, preservation and protection of the island’s heritage, historical structures and natural spaces, dismissing and/or forgetting its rich history will never be an option. While impossible to capture the vast passion and tangled history of St. John with a few brushed bits of silver, I’d like to believe my pounded and blended little works of art are something magical and inviting, fine and strong, just like the little island itself. The oxidized, aged and rubbed patinas in each piece represent the idea of depth, complexity and accumulation that is only acquired over time. The individual shapes rest against one another, side by side, each segment joined to the next forming an intact, complex whole. This is meant to honor the diversity of the island, while the overwhelming theme of circles represents continuity and unity with no beginning or end. Certain pieces are wrapped and held together, stitched up from place to place only to become whole again and, as everything is, infinitely connected. Karen Calandra is a jewelry designer and metalsmith whose philosophy is creating wearable works of art with modern simplicity. Karen is inspired by the irregular yet absolutely perfect shapes of nature. Originality and quality craftsmanship are important to her and each piece is handcrafted using raw materials. Karen studied at a technical jewelry design school in Florence and Pennabilli, Italy as well as stateside with Todd Pownell. There are additional pieces of Helen's at the gallery. 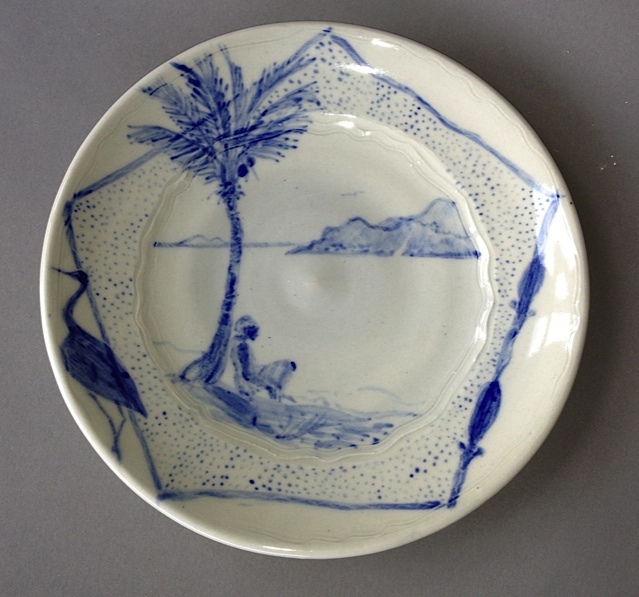 "The concept is for these simple wheel-thrown domestic bowls made from St Thomas clay to hint at the shorelines and tidal areas of the Virgin Islands. The island has a richness of textures, patterns and contrasts in the space where ocean meets land and somehow these work their magic into my subconscious. The blues of the ocean that I look onto change hour by hour, day by day and I have made various copper blue glazes to echo these colours." Images forthcoming - thank you for your patience. Casey Giakas's ceramic work combines form with function. Concentrating on creating beautiful and innovative wares for everyday use, she likes to focus on pushing the envelope on everyday tableware and other items for your home. 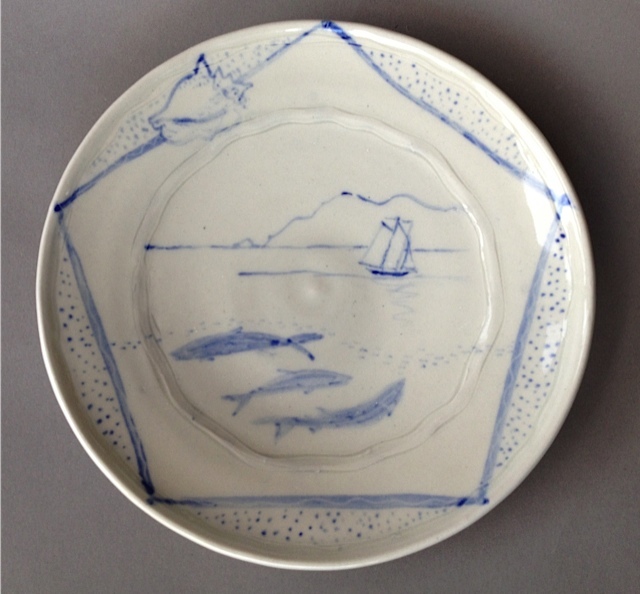 Thinking about surface applications that will flow cohesively with certain glazes to represent inspiration that she draws from living on St John, or from some of her other travels around the world. 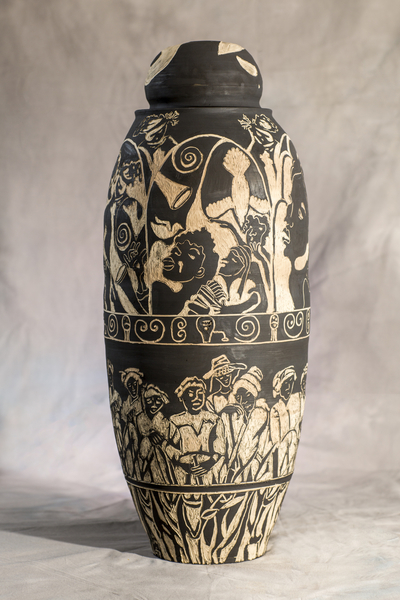 Purposely altering her forms to create an intimate experience for people and her pots. Feeling a thumb print here, or an indention there helps people identify that a person made this, gave some extra time and thought about how one might interact with this piece, how something just a little extra was given into making it comfortable and a household favorite. Moving to St. John in September of 2006 Casey remained “On Island” for three and a half years before she decided she needed more life experiences. Life took her to Montana to work at a small production studio, and Italy to assist at La Meridiana International Ceramics School in Tuscany. During her time away she couldn’t stay away from St. John, returning for a month or two here and seven months there. Finally after much consideration she decided to make St. John her home. Teaming up with her long time dear friend and mentor Gail Van de Borgurt, they have moved Maho Bay Clay Works to a different location taking the best of the past to move towards a new future for life and pottery on St. John. About a decade ago I attended an event at the ballfield across from Mongoose Junction. I will never forget this: an older lady had a selection of beautiful and functional items that she had woven from vine material. I used all of the cash that I had in my pocket to buy a wallet, a bracelet, a set of coasters and a post card from the treasures that she offered. This was my first encounter with sustainable craft, a longtime tradition on St John, and the "perspective" that I am celebrating in my work "Only this actual moment is life". 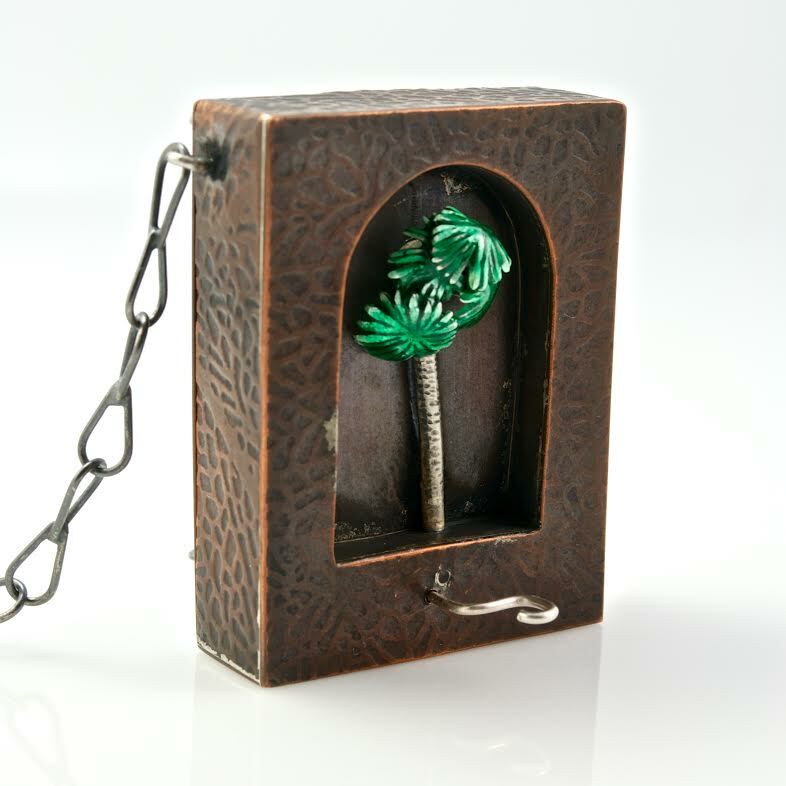 When you turn the crank on the pendant, an enameled tyre palm blows in the wind, bringing to mind the handmade tyre palm brooms that every household once kept in their homes. For the animal shall not be measured by man. In a world older and more complete than ours they move finished and complete, gifted with extensions of the senses we have lost or never attained, living by voices we shall never hear. They are not brethren, they are not underlings; they are other nations, caught with ourselves in the net of life and time, fellow prisoners of the splendour and travail of the earth. The above quote is still very relevant today, almost 100 years later. Beston's book was a major influence for the establishment of the Cape Cod National Seashore. While it is true that our culture seems to have institutionalized a separation from nature with the end result being that natural resources are exploited for the monetary gain of a few, I know that there are people out there who do actually hear and live by Beston's "voices". 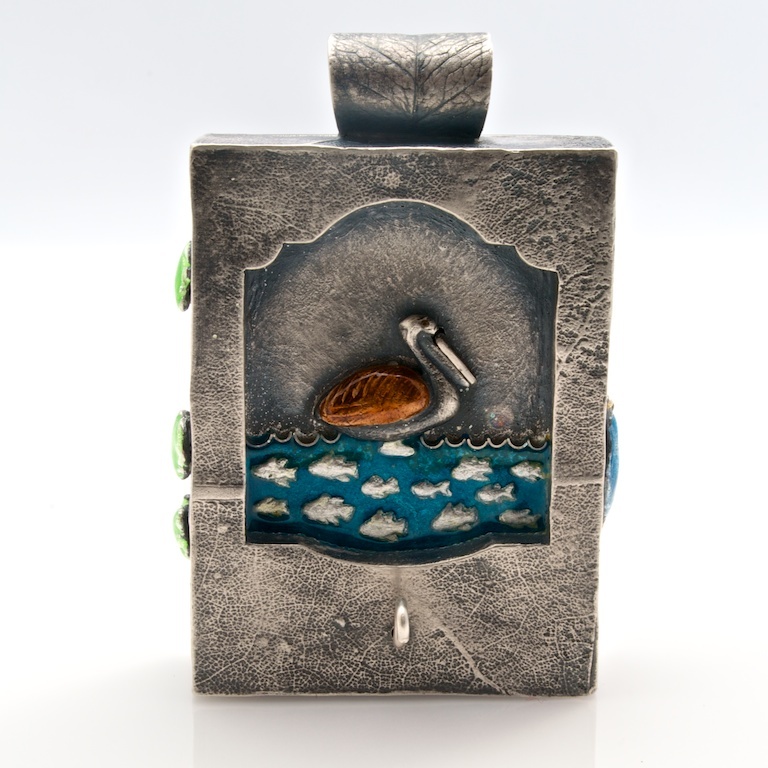 I have made this pelican automaton pendant for them. When you turn the small crank, a fish is revealed in the seabird's mouth. This is a reminder that the music of the precious natural world around us is unequivocally essential to our enjoyment of music-making and dreaming. 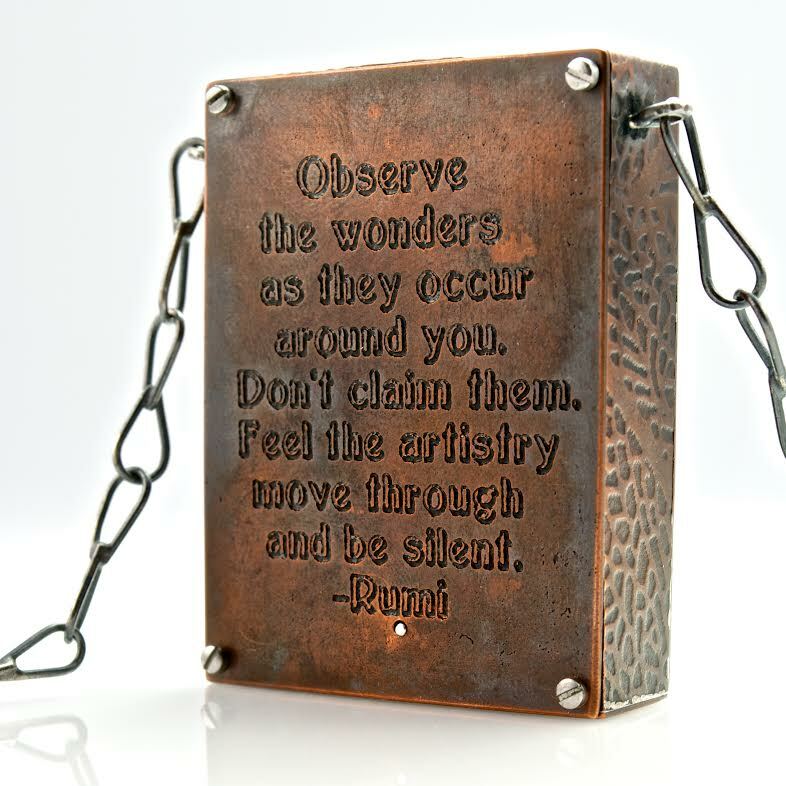 Art jeweller and automaton maker Kim Nogueira grew up in New England surrounded by antiques and curious about human nature, earning her BA in Sociology from Smith College. 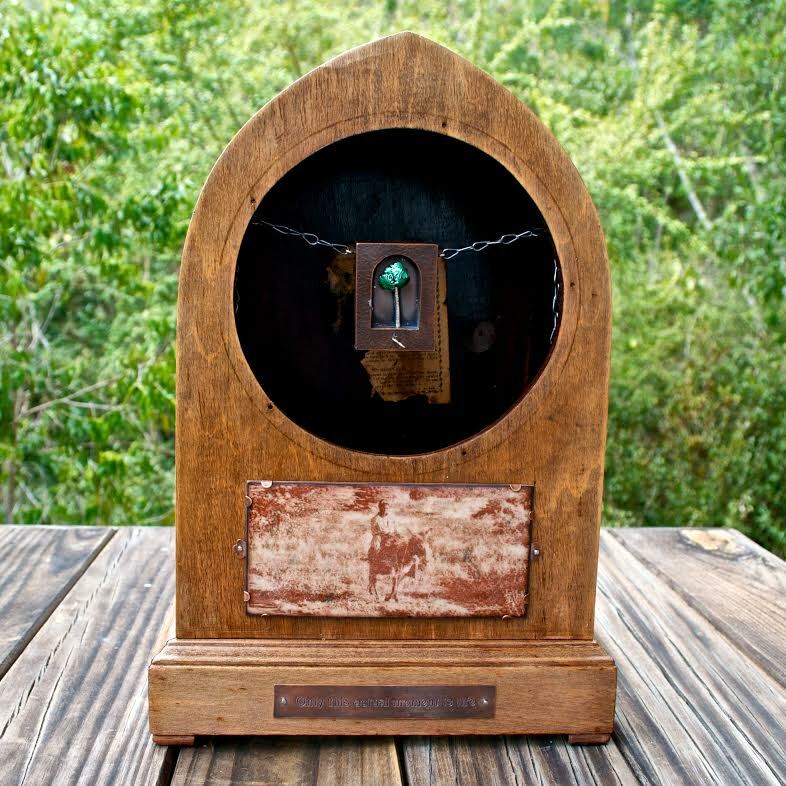 Working as a production goldsmith for over a decade introduced her to the world of metal and laid the foundation for her explorations in wearable, thought-provoking automata. 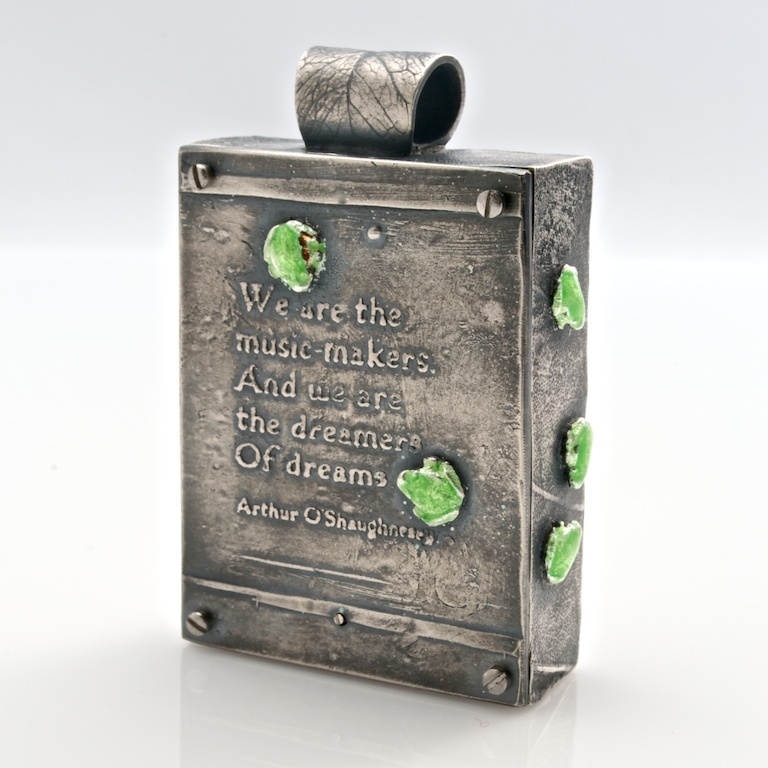 "Employing the traditional fabrication techniques of the goldsmith in combination with etching, metal clay, sand casting, electoforming and enameling, I construct complex narratives in metal that speak to the challenges of our time. By incorporating movement and interaction with tiny automata, I hope to explore and keep alive the enigma that is childhood wonder and draw attention to the marvels and preciousness of our beautiful planet. For about a decade I have collected early to mid-twentieth century vending machine toys and gumball charms, Stanhope peep charms, antique mechanical toys and lilliputian Victorian curiosities. I work directly with these diminutive oddments, making molds of them for use in my work, deconstructing them to make the mechanical figures and details in my wearable automata. I manipulate them to form my own narrative, integrating universal themes in tandem with the questions of my own heart." During the Danish ownership of St. John in the 1700's until emancipation on July 3, 1848, heroic enslaved plantation laborers worked hard in the fields and after hours in their church communities to move the Islands towards freedom for all. The average lifespan of the early slaves was 3 months due to the exhausting labor that was demanded from them tending the sugar canes. When the missionaries came to share the gospel of Jesus Christ through both the Moravian church (in about 1744) and the Lutheran church (later),the plantation owners were compelled to allow them their services and for their children to be baptized. This blossoming faith had a huge effect on their largely non-violent, decades long and continuous, relatively peaceful protests by many who were enslaved. The hope of the gospel that "God was for all and that He is good" (to this day, this is still an important expression with the West Indies of faith) enabled them to live boldly and free in their hearts if not in their bodies. My piece is about this struggle, and this journey. 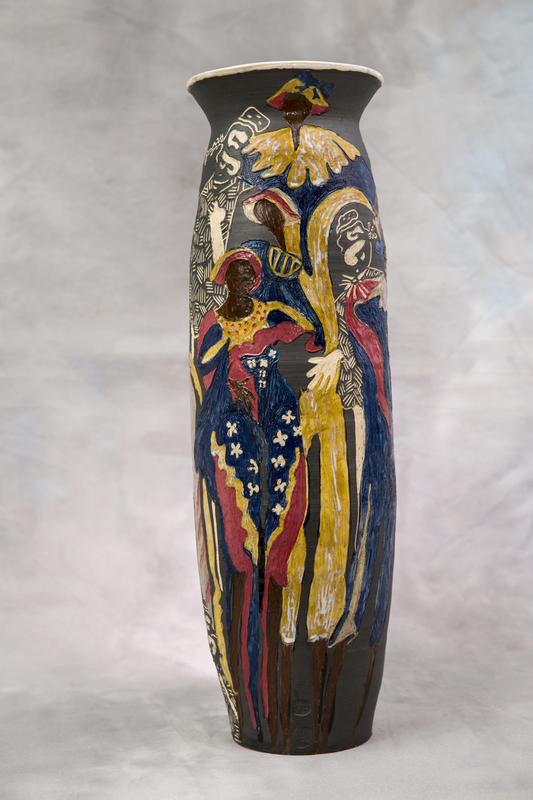 It is glossy white inside the urn to depict eternity and the mystery of hope. 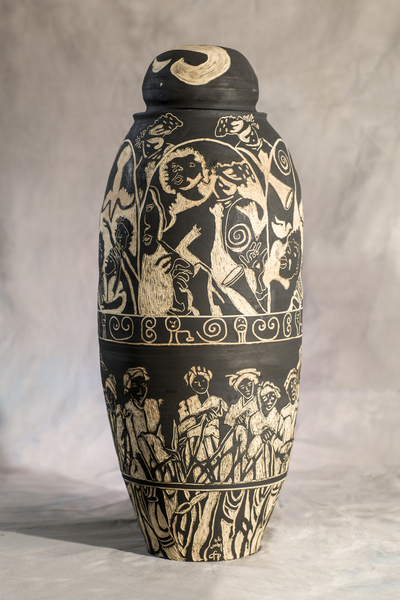 The outside is mat black with white carvings to depict the starkness of the earthly journey. The lower rung is sugar cane, in the middle are women field workers, the next small band is petroglyphs. Finally, the images within the arches reflect the mystery of hope in dance and song and praise with the people walking by a map of the heart that is obscured from their daily view. To truly see God's glory is to make our heart light. Above the arches (and within some as well) are those jumbies which move between the worlds of here and now and eternity. One of the big issues that people ask: Why is there evil if God is so good? People have always been given choice for our God in the heavens is not a dictator but a King who woos us with His mercy and love. The response to this thought is: If that is true, then how would He allow such brokenness for the people of the Island? My personal answer to this follows and is expressed in my artwork: The house of the heart is more spacious than we can imagine. It is capable of holding more than we can dream. Sometimes it grows larger because our hearts break. Not every life experience ends in joy. God, who does not will the breaking, nonetheless knows what to do when the shattering occurs, knows how to work with the fragments to create new passageways, new doors, new chambers in our heart provided we are willing, that is, provided we choose not to close our hearts in response to pain. The astounding ability of our heart to grow more spacious depends on something stranger and more wondrous than magic. It depends on the endless grace that flows through each chamber and every room, already preparing us for what we cannot see or know from here. Our hearts depend on the Love that continuously keeps vigil for us in our gladness as well as our pain. This IS the legacy of these Islands. The character and culture of the people who are descendants of the slaves radiate a gentle glory even today. Their mantra: God is Good...All the time...All the time... God is Good is one of the delights in my life and I am grateful that their journey has been marked by gentle courage, persistence, and most importantly a quiet yet genuine faith. Those incorrigible Jumbies! Welcomed back to St. John in the 1950s about the same time as the Rockefeller family began acquiring large land tracks of land to preserve the culture and simple life here on St. John. The original Jumbies are rooted in the West African heritage and are a spiritual and ancient African art form. They are the keepers of the people and of the Islands they inhabit. Their great height allows them to see far distances and ward off danger. They are considered a good omen. They can be a bit mischievous so to keep them from entering into your home and causing havoc while you sleep, children were taught to keep their shoes outside so that the Jumbies would spend all night trying to get their non-feet into those same shoes. When the enslaved Africans were brought to the Caribbean their religious traditions and observances came with them. Forbidden by the European slave masters to practice their customs, they transferred them into a festive context to disguise the ceremonies. Mocko comes from a central African language that means to heal. Jumbies were vital to their enduring hope as a people and to dress up as a Jumbie was to be empowered by their qualities. Today, the heritage of the Jumbie is as vital to this Island as the Heritage of our National Park. My artwork shows the original Jumbies in black and white and the festive Jumbies in color to demonstrate their interwoven nature. I came to St. John 12 years ago because of the light. I was a painter at the time, working with watercolors and part of the gallery scene in La Jolla, California.. Arriving here, I began to use clay as my medium after 30 years away from it. 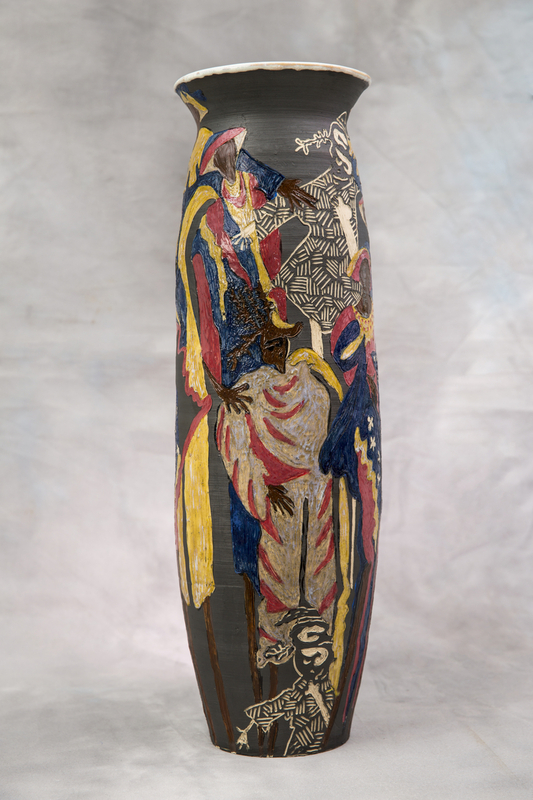 To this day, I call myself a “painter who pots” for I love the movement of the glazes across my varied forms whether they are carved out from, drawn into, or simply overlapping clay forms. My inspiration springs from the light: the light of the sky, the light of the heart, the light of St. John. My clay forms hold light: they have form and function for everyday living just as our human vessel has been formed for this as well. My work is a metaphor for my soul life: to be a living light and to have the courage to be unique on this journey we call life. 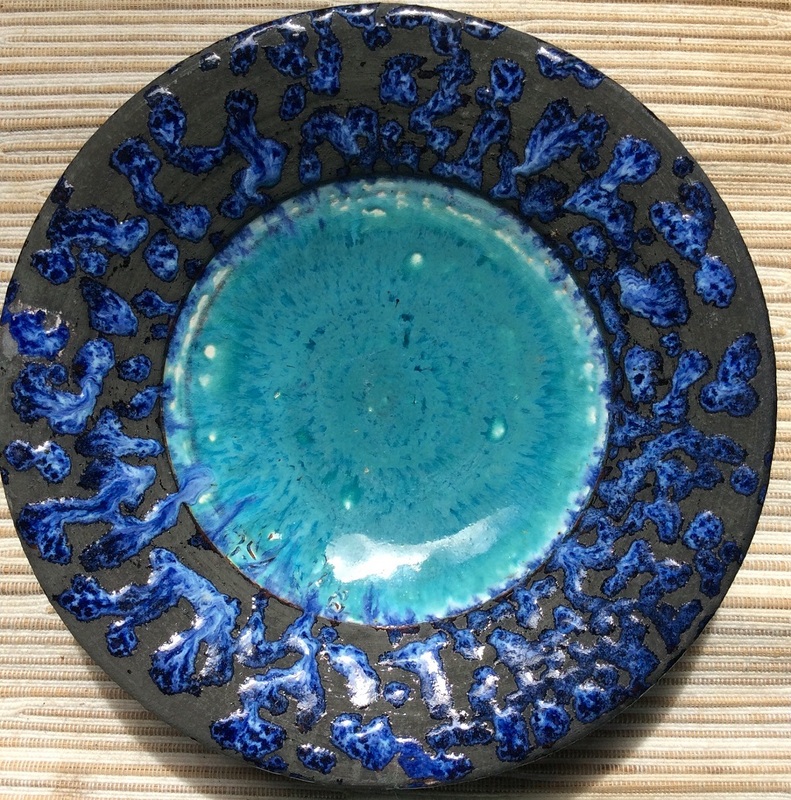 A lifetime of work in ceramics has brought me to explore a variety of clays and firing techniques: wood, salt, vegetable oil, pit firing. 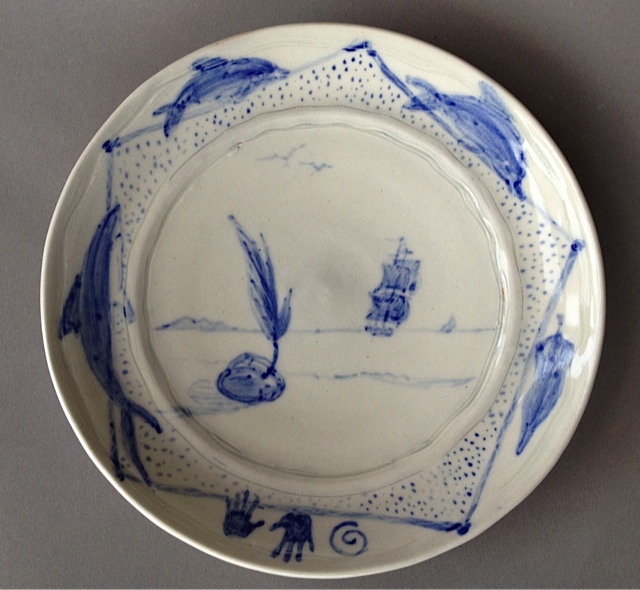 For this show I revisit the theme of cobalt blue imagery on a porcelaneous white stoneware. 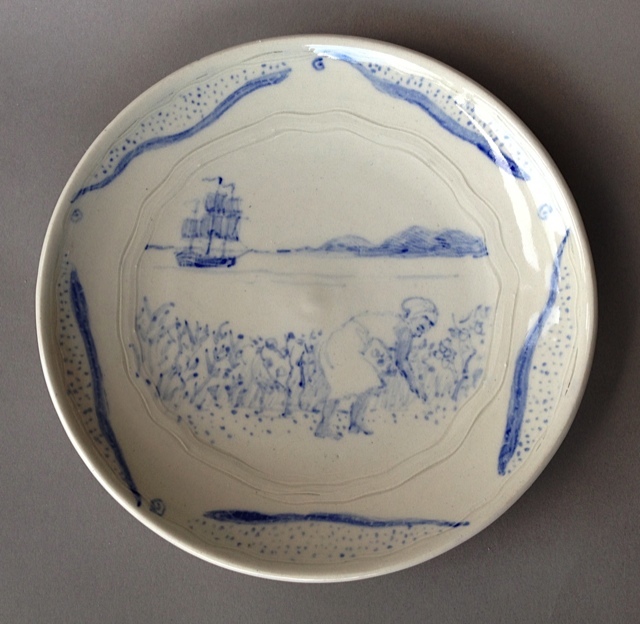 This style of pottery was favored by the plantation owning Danes in the Caribbean during the Sugar/rum growing financial craze of the 17th-19th centuries. 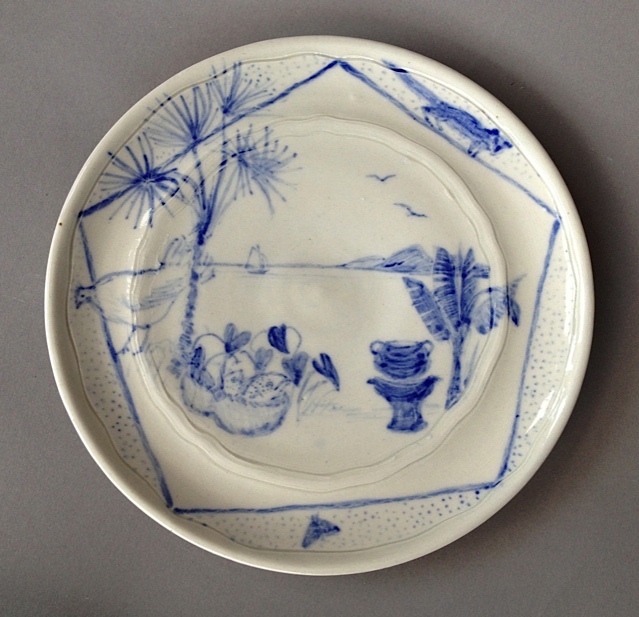 The Blue on white-ware shards can be found in and on the earth all over these islands. 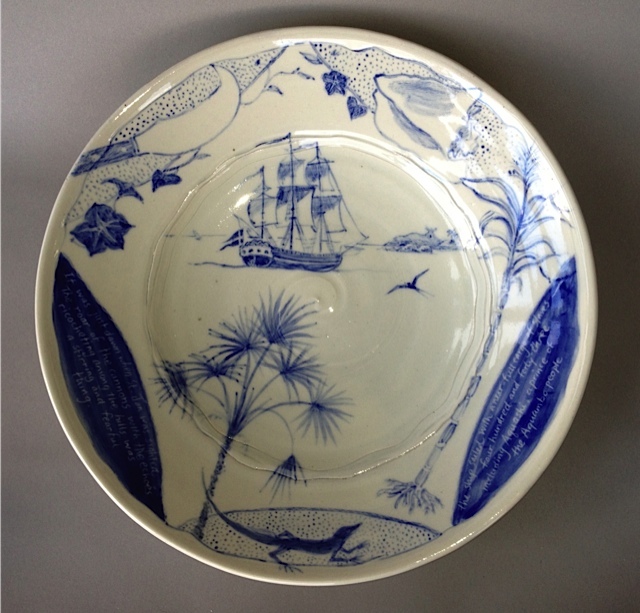 This style was developed by the Chinese and reached its height of mastery in the Jindezhen kilns during the Ming dynasty.It represents the pinnacle of the development of Chinese blue and white porcelain and was a highly prized export to Europe and throughout the world. 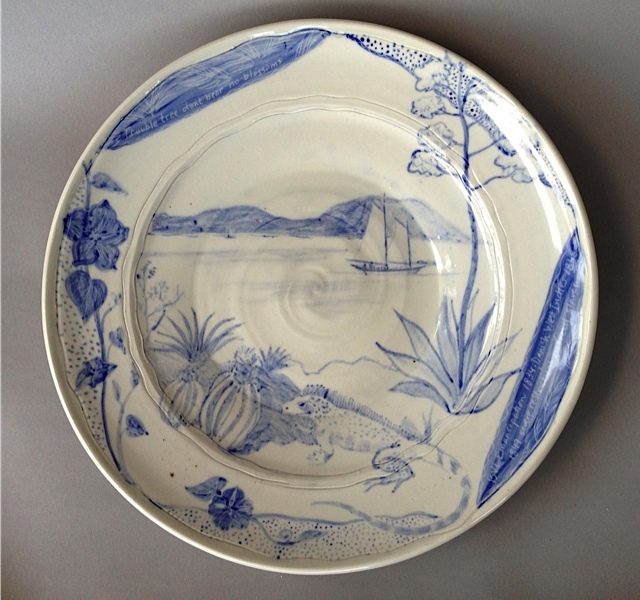 European potteries strove to emulate it with various clays and kilns including Majolica in Italy and Delft in the Netherlands. Owning it became a symbol of status and wealth. 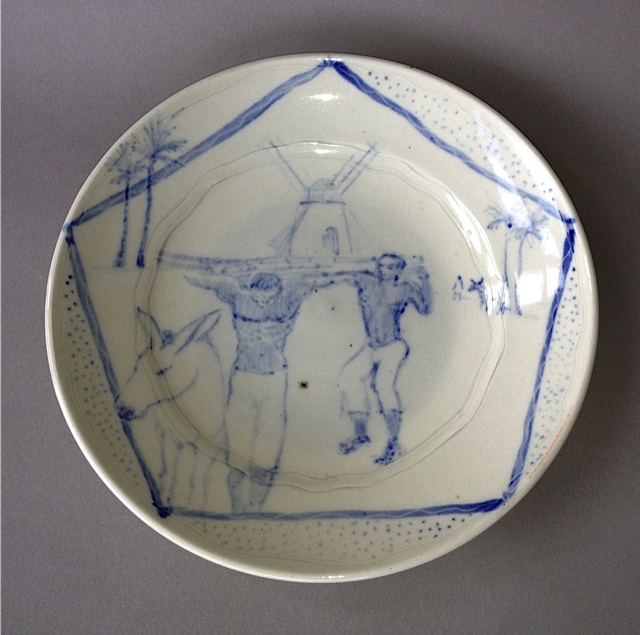 In my series of plates for this show “The Past: Reflections” I explore thoughts about slavery, human ignorance, cruelty and suffering that was driven and justified by money, greed and power. A positive result of this tragic era however is the the rich Afro Caribbean Culture that exists today. 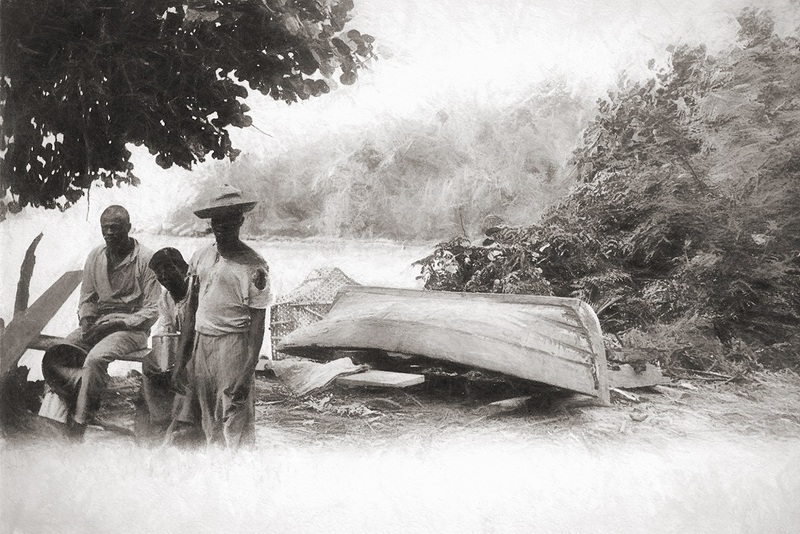 In my story I touch on the post-slavery period’s simple way life: farming, fishing, basket making, sailing and salt trading that is the beautiful foundation of West Indian life on St John. As a tourism driven economy that continues to evolve those who gain from it need to have awareness for the larger community. St John is a special island with its immense natural beauty but it is also full of the beauty of giving and sharing by people from diverse backgrounds. Many work hard here to achieve a very modest standard of living. There are people here who can trace their family roots to those survivors of the “middle passage” and others who feel that they have nothing to do with any of that. Our island is small and its needs are big. The study that brought me to create this work I hope will continue. Like the “scraffitto” technique I use on my clay drawings ,I feel that my understanding has just scratched the surface. Thanks to Kimberly Boulon for conceiving this topic to explore and inspire. 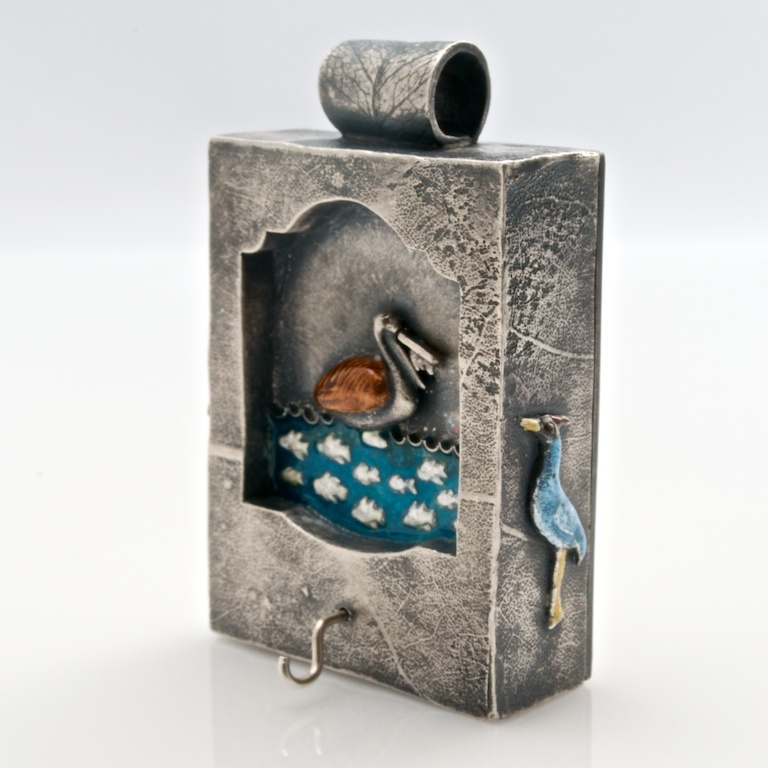 Gail Van de Bogurt’s functional clay work is both refined and playful. 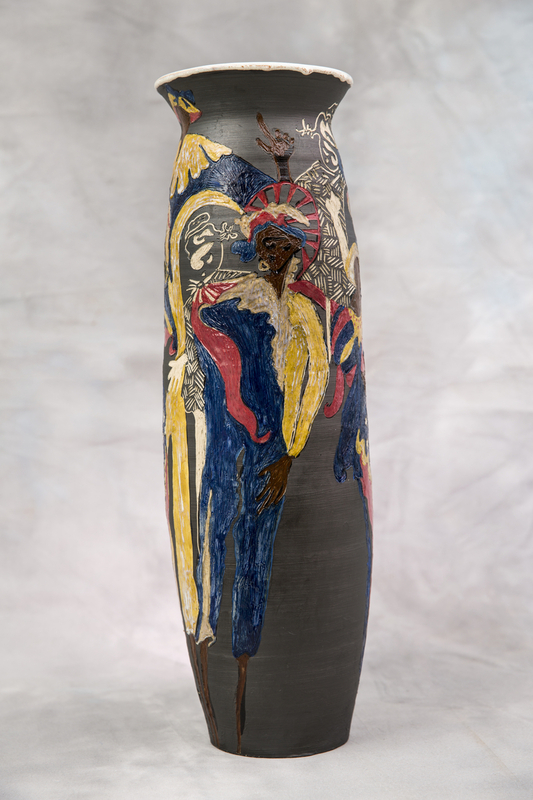 Her gift for combining form, surface quality and imagery resonates throughout her three dimensional work from functional pottery to sculptural boxes to large multi-component sculptures. She likens the form, whether a teapot or a sculpture, to a three dimensional canvas where her brushwork and carving create another level of motion and meaning. “I came to the island of St. John for my first visit in 1987 and left with a dream to live in the Caribbean. In the winter of 1989 I sailed with friends on a 6o ft. sloop from Long Island, NY. With my small box of watercolors I explored beaches and hiking trails and the richness of Caribbean life allowing myself to be influenced by its color and imagery." A lifetime of work in ceramics has brought her to explore a variety of clays and firing techniques: wood, salt, vegetable oil, pit firing. She spent ten years developing a ceramic arts program at Maho Bay Camps with a focus on developing sustainable ceramic technologies. 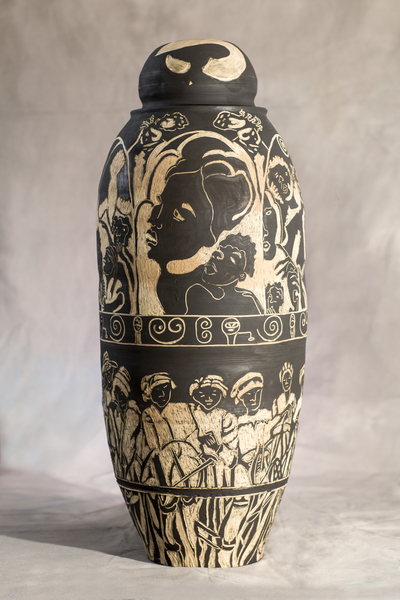 She currently offers classes in ceramics and watercolor painting at the “Pottery in Paradise“ Studio and Gallery. Now located at Pickles Deli in Coral Bay, Gail has partnered with potter and friend Casey Giakas to create studio, classroom opportunities for those interested in the ceramic arts. Gail was one of the original 3 co-founders of Bajo el Sol Gallery at Mongoose Junction, now owned by Tom and Livy Hitchcock. She has been one of the Resident Artists at Caneel Bay Resort since 2002, offering watercolor painting classes for guests and exhibiting paintings at Caneel’s Turtle Bay lounge with colleagues Livy Hitchcock and Vicki Rogers. All original photos used by William Stelzer in his photo collage were provided by Eleanor Gibney. William then used PhotoShop to create more painterly images from the originals. 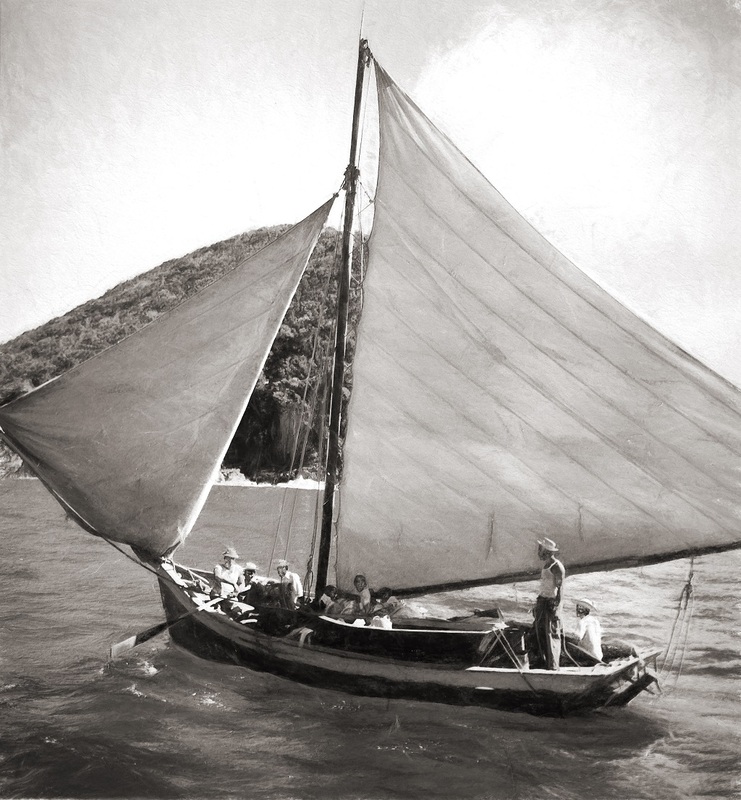 We hope you enjoyed their projection on the historic Frenchtown (St. Thomas, VI) sloop sail built by Theodore and Helen Danet ca 1960 and provided by their grandson, Robert Danet.